MR. MARK SOFTER. This is a softening agent for slidemarks. It has the effect of closely adhering slidemarks to curved surfaces. Method of use: 1. First, apply a quick drop to the area where the decal will go using the brush attached to the cap. 2. Apply decal over it. 3. Apply gentle pressure to the decal with a soft cloth, removing any excessive liquid and sticking the decal down fast. The decal will stick perfectly, even on uneven or curved surfaces. If air gets in between the decal and the model surface, after drying delicately prick the decal with a needle and insert Mr.MARK SOFTER through the resulting hole. The air will escape, and the decal will stick down firmly. 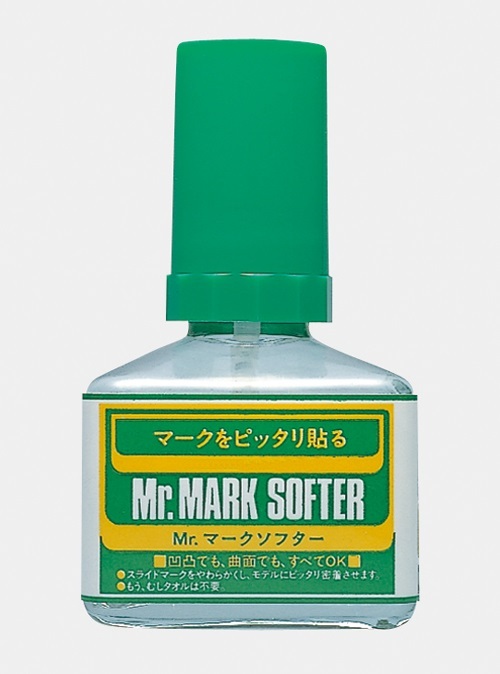 MR. MARK SOFTER ES UN AGENTE ABLANDADOR DE CALCOMANIAS Y TIENE EL EFECTO DE ADHERIRLAS PERFECTAMENTE A LAS SUPERFICIE DEL MODELO Y TOMAR LA FORMA DEL PLASTICO AUN SIENDO IRREGULAR O CURVO. METODO DE USO: 1. PONGA UNA GOTA EN LA SUPERFICIE DONDE IRA LA CALCOMANIA USANDO EL APLICADOR. 2. COLOQUE LA CALCOMANIA. 3. APLIQUE LIGERA PRESION CON UN TRAPO O COTONETE Y ELIMINE EL EXCESO DE LIQUIDO CON UN PAPEL ABSORVENTE, RAPIDAMENTE ADHIERA LA CALCOMANIA EN SU LUGAR. DEJE SECAR POR 24 HORAS.- CUANDO LA SOLUCION INICIA SU EFECTO LA CALCOMANIA SE DEFORMA. MUY IMPORTANTE, NO TOQUE POR NINGUN MOTIVO LA CALCOMANIA O SE DAÑARA-. LA CALCOMANIA SE ADHIERE EN FORMA PERFECTA HAYA O NO SUPERFICIES IRREGULARES. SI EL AIRE ES ATRAPADO BAJO LA CALCOMANIA, DESPUES DE DEJAR SECAR, PERFORE CON UNA AGUJA E INTRODUZCA MR. MARK SOFTER POR EL AGUJERO, EL AIRE ESCAPARA Y LA CALCOMANIA SE ADHERIRA FIRMEMENTE. PARA MEJORES RESULTADOS USE CONJUNTAMENTE MR. MARK SETTER, ESTO AUMENTARA LA ADHERENCIA DANDO A LA CALCOMANIA UN ASPECTO DE PINTURA. CONTENIDO 40ml.